Simplified Head Assembly – Petersen Inc.
Petersen Inc. fabricated two Simplified Head Assemblies (SHA) designed to Westinghouse Nuclear Services (WNS) drawings and specifications. The SHA hardware is certified to meet NQA-1 requirements for NUREG-0612 Special Lifting Device Components. The project scope included forming, large and small precision machining, welding and safety related painting. SHA hardware was assembled and functionally tested prior to shipment to proof the critical features that would mate to existing site hardware. 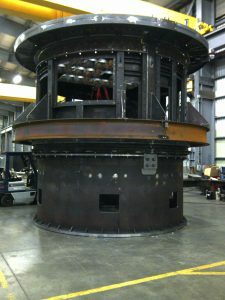 Critical features of the assembly were: (1) maintain .060 true position from the bottom surface of the mounting flange up through the three shroud segments to the top grid plate that has 91 holes that are tied to the reactor head. (2) Maintain a .030 true position of the three lift links that are attached to the middle shroud that mate with the SONGS lifting tripod. (3) Demonstrate that all weldments and assemblies fit together and function properly. WNS has been contracted by Southern California Edison to design and manufacture a SHA for SONGS. 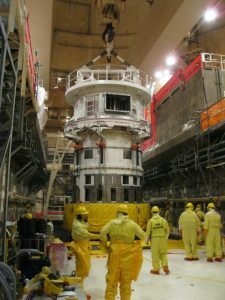 WNS will install the SHA on Unit 2 and Unit 3 nuclear reactors during scheduled plant outages.